Back in the 1990s, I saw dozens of kids movies because I had kids that were just that age. "That Darn Cat", "The Mighty Ducks", "Three Ninjas", "Casper", "Matilda", "The Indian in the Cupboard"..., the list seems endless. Many of them were fine films, especially for a kids audience, but I have never felt a need to revisit them after my own kids grew up. It may be true that nostalgia will only carry you so far. There were however films from my own childhood that I can still watch as an adult and treasure despite the fact that they were kids movies. "Chitty Chitty Bang Bang", "Swiss Family Robinson", "Robinson Crusoe on Mars", Mysterious Island" hold up pretty well. 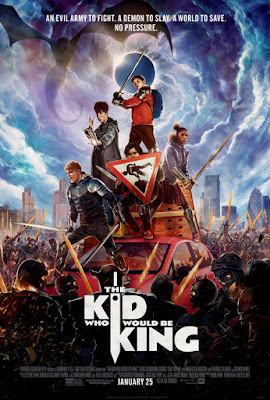 I think that "The Kid Who Would be King" fits better into my list of childhood style films than those of my children. When I first saw the title and the poster, I thought it looked a little cheesy, even for a kids movie, but it turns out that it really is well done. The writer-director of this movie is Joe Cornish, who contributed to screenplays for "Ant-Man" and "The Adventures of Tintin" as well as his own picture. the excellent "Attack the Block". In fact, this concept is not too far astray from the premise of this movie, so it is a natural fit for his way of thinking about young people. This is maybe a little more sanitized, but it is a younger audience that it is seeking. The four principles are new to me, but they nicely fit into the stereotypes that the film counts on us seeing as a shortcut to character development. Merlin does age backwards. In his older version he appears as Patrick Stewart in just a few scenes. Usually, the young Merlin is on hand and he is played by a David Tennant doppelganger who provides guidance and exposition for the younger leads. There is a little inconsistency concerning the rules under which Merlin can operate during the day, but most people won't notice that, instead they will be amused by the comic bits that this gawky teen finds himself in. Alex, the lead, is played by Louis Ashbourne Serkis, who happens to be the son of actor/director Andy Serkis of Marvel/Lord of the Rings fame and actress Loraine Ashbourne, a well known performer from British television. The kid actually looks like a real kid and not just a pretty face to put in the lead spot. Bedders, his chum is played by a newcomer who seems to be channeling the sidekick character from the recent Spider-Man movies, a graft that works pretty well. There is just enough derring do and scary special effects for the family audience this movie is seeking. Like cream rising to the top, I suspect this will be a winner down the road even if it does get pushed aside this year by other family fare. The opening comic illustrations are excellent, the spirit of the movie and it's ultimate theme are admirable, and the youngsters are game. This is a charming family film that I can recommend to parents to take their children to. I took mine, shes 30 and she enjoyed it too. I dismissed this after seeing the trailers but the reviews have surprised me. You have me wanting to give it a shot. I was surprised how much I enjoyed it. Worth a visit.